Another favorite Spanish court painter was Francisco José de Goya y Lucientes, more commonly known as Francisco Goya, an 18th century Romantic painter in Spain and a highly accomplished print maker. He was highly regarded as the last of Spain’s Old Masters and the first of the modern painters of the country. During his career, he was able to paint the portrait of Joseph Bonaparte and made historical paintings to document the Peninsular War, with his “Desastres de la Guerra. His art was somewhat subversive and he was bold in his use of paint, and he became a model for subsequent artists as Francis Bacon, Pablo Picasso and Édouard Manet. Goya was born in Aragón, Spain on March 1746. He first studied under José Luzán in his early teens and later moved to Madrid to take art lessons from Anton Raphael Mengs, a Spanish painter who was also popular with the members of the royalty in Spain. Goya and his mentor usually clashed, resulting in him receiving unsatisfactory examination results. It was under the tutelage of Francisco Bayeu y Subías where Goya learned how to employ the finer tonalities in his work, for which he would later become famous. He married his mentor’s sister, which allowed Goya to receive work as a designer for the Royal Tapestry Factory, since Bayeu was a member of the Royal Academy of Fine Arts. Goya drew designs for the factory for five years, creating about 42 patterns, most of which were used to insulate and decorate the bare walls of the Palacio Real del Pardo and El Escoril, which were the residences of the Spanish royals. This led to his talents being recognized by the monarchs. The canvas he created for the Church of San Francisco El Grande’s altar paved the way for Goya to be a Royal Academy of Fine Arts member. The Count of Floridablanca asked Goya to do his portrait in 1783. During this time Goya also came to know the Crown Prince Don Luis, and he painted several portraits of the young prince and his family during the two summers that he spent with them. 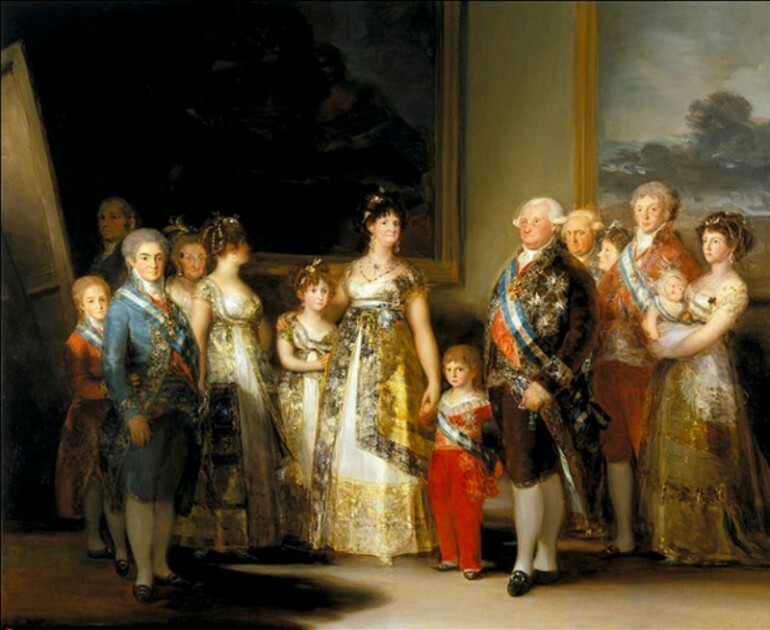 The number of Goya’s royal patrons grew in this period, as he was introduced to the King, the Duke and Duchess of Osuna and several personalities in the kingdom. He became a salaried painter in 1786, painting for King Charles III. It was in the late 1780s, when King Charles III died (1788) and the French Revolution occurred in 1789 when King Charles IV was in power that Goya reached his peak of popularity with the royals. He became the painter to the court of Charles IV in 1789 and ten years later received the appointment as the First Court Painter. He was tasked to paint the portraits of various nobles, the Prince of the Peace, members of the royal family and the King and Queen of Spain. His portraits were lacking in diplomacy and flattery, which became a trademark. Some modern interpreters of his paintings saw this as a social satire, especially the painting, “Charles IV of Spain and His Family.” With Queen Louisa known to hold the real power, Goya placed her in the center of the painting. Goya’s approach in some of his earlier works were in the Classic style, but generally, his works are classified as from the Romantic period. As he developed his style, some of his works showed the influence of another great Spanish artist, Diego Velázquez. Most of his works of frescoes for the churches in Madrid showed traces of the artistry of Rembrandt. Goya was a brave man, who exhibited his attitude towards life in there different phases. In his youth he accepted the work with enthusiasm but began to criticize it during his manhood. He became disillusioned and embittered with society and people in general in his old age. He shocked the Spanish public when he painted “La Maja Desnuda” or The Naked Maja. The identity of the model remained unknown despite the number of alleged sitter. It was a beautifully composed full size image of a naked woman, in which the pubic hair was shown for the first time. The public demanded that clothes be put on the figure. What Goya did was to replicate the painting, in the exact same pose, but this time the female figure was fully clothed. These paintings were not publicly displayed during the artist’s lifetime. Both paintings are now displayed at the Prado Museum in Madrid. Goya showed some of what he felt in his paintings, such as “The Charge of the Mamelukes,” “The Third of May 1808” and “The Disasters of War.” He delved into dark subject matters through several cartoons and paintings such as “Yard with Lunatics” and “Saturn Devouring His Sons.” Some of these could be attributed to his illness, which started with deafness to paranoid dementia due to an unknown trauma of the brain.